The Dunlop JBF3 Joe Bonamassa Signature Fuzz Face is one of the best fuzz sounds I've ever heard. This pedal was made to be cranked wide open, and the NOS Russian Military Germanium transistors really deliver. The original Arbiter Electronics Fuzz Face has become something of a legend in the effects pedal world over time. After all, this is a pedal that players from Jimi Hendriz to Eric Johnson has used to help get their signature sound. While the companies that make the Fuzz Face have changed over time, the pedal is still the "holy grail" of fuzz pedals for many. One current devotee is Blues legend Joe Bonamassa, who has partnered with Jim Dunlop to produce a very distinct signature edition. The JB3F ives in a gorgeous copper shell equipped with NOS Germanium transistors. Everything else is standard Fuzz Face layout. I ran the JBF3 through a Dr. Z MAZ 18 Jr and Dr. Z Route 66, each through a Dr. Z Z-Best Cab. I used both a Gibson Les Paul Traditional and a Fender Eric Johnson Stratocaster. Having used both vintage and contemporary Fuzz Faces before, I knew from previous experience that my favorite fuzz tones came when the pedal was just plain cranked, just like David Gilmour and the pedal's namesake run it. That's not to say that the JBF3 has to be wide open to be effective. For dirty rhythm work, I found that mid-level settings offered nice growl and punch for chords. Not so much for lead work, but when cranked, the JBF3 takes on a life of its own. 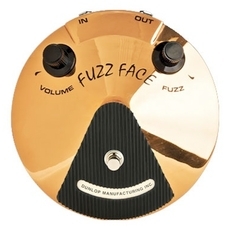 Not to be overly critical, but I've found Dunlop reissue Fuzz Face pedals to be, well, less than inspiring in recent years. However, the Bonamassa model is one of the best fuzz sounds I've ever heard. This pedal was made to be cranked wide open, and the NOS Russian Military Germanium transistors really deliver. This particular fuzz isn't the 200 lb violin sound you expect from Eric Johnson. It's more of a "dirty smooth" sound that's a bit on the gritter side. Still, it's a versatile fuzz that could be used a wide variety of gigs. It sounded great with both single coil and humbucking guitars through either clean or dirty amps. Find your new or used Dunlop JBF3 Joe Bonamassa Signature Fuzz Face for sale on eBay today!